Making Magnolia pink flower....This paper flower patterns can decorate a gift box or beautiful rooms decoration. - Draw watercolor petals or petal print templates available and then cut into petals. 5 petals doubled, curved claws and pull the tip of the first 5 remaining petals. Blue paper cut into 4 plates sepals. 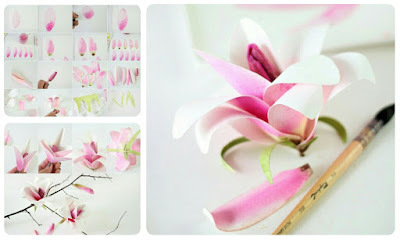 - You cut one piece pink tissue paper rolls and twists as the pistil. Next, paste 3 double alternating petal pistil wrapped inside, then paste the remaining two outer petals form the first layer of petals. - Continue paste remaining 5 petals alternating petal outside first class as class Monday petals.Then you paste 4 sheets of blue paper flower calyx outside.